We have new challenge for you at Elisabeth Bell's World challenge. Just take out your pretty Elisabeth Bell images and start crafting and let us see, please your gorgeous cards . For my card I did use the digi image Li'l Princess Tutu by Elisabeth Bell, isn't she pretty ?! Christmas Ornamet with digi image by Elisabeth Bell ! Sorry I have been MIA, so busy these days :). Hope everyone is well and enjoying the gorgeous Fall weather. Today it's my time to post as DT member at the Digi Bells to show you a project. I did decorated a Christmas ornament, which I have bought at my local garden store. 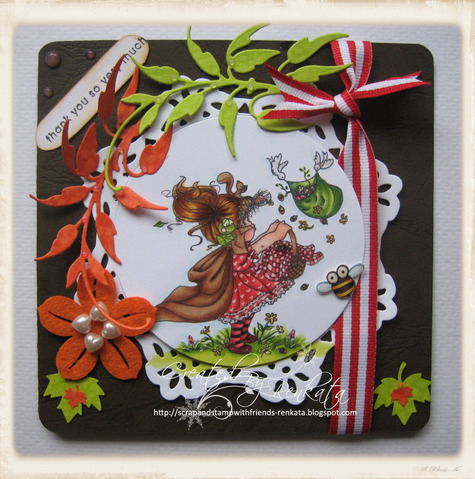 To decorated the ornament I did use the adorable digi image "Pati's Kisses"by Elisabeth Bell. 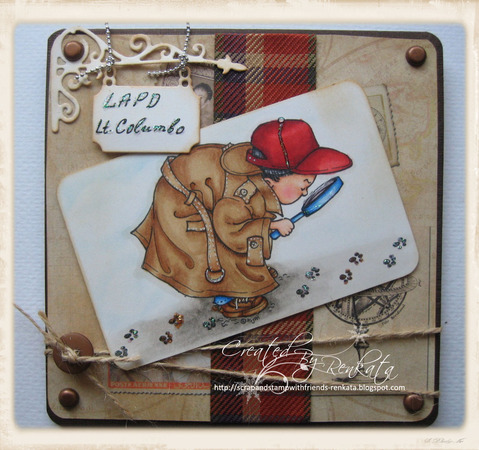 Hope I have given you an idea to decorated your old or new Christmas Ornaments with adorable images from Elisabeth Bell. We do have a GDT call at the Digi Bells, you can read all about that HERE. FUN HALLOWEEN (or) FUN FALL COLORING!! So your images should be Halloween or Fall Themed!! Have fun but you must use ORANGE tones somewhere in your images! 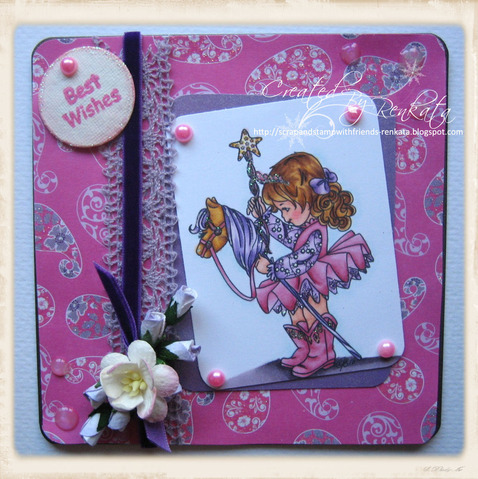 !Our sponsor is Glitterbabe, I am using the image- halloweenie teenie, the image is coloured with Copics. We will be waiting to see your gorgeous cards at CMC Copic Challenge. Now , about the Winner of my Trick or Treat bag- this is Dana from Got Joy Creations. Today we the Digi Bell's Team are having blog hop to showcase the new stunning and adorable digi image "JANIEL'S HARVEST" by Elisabeth Bell. Today our sweet Janiel is having a Birthday too. You all know by now that you can win this cute image by doing the blog hop or doing the blog hop and make a card - "FALL FUN" using any Elisabeth Bell image and post it on the Digi Bell's blog. 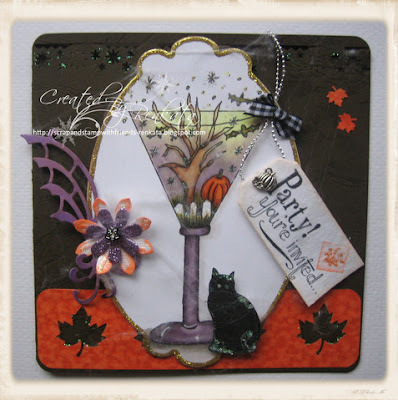 You have time till 28 Oct.
Get out the adorable Elisabeth Bell's images and start crafting , lol. Now is time to hop over the sweet Janneke. Hello My dear blog Friends. I want to share with you some news and very adorable "Trick or Treat" bag! The News is that I am a part of the amazing CMC - Color Me Creative Design Team . That's my dream come true, yahoooooooooo, lol. I am sure you will love it too, the challenges are very awesome and you get's a tips and info from the talented and amazing Suzanne J Dean and of cource from us ( The DT) too, lol. And to celebrate my news I did make a "Trick ot Treat" bag with the cute image from Wee stamps ~Hazel ~ the wee witch by Sylvia Zet. The Shabby Tea Room ~"Shabby Autumn"
If you like it you can take a part of my "Trick or Treat" bag by answering this easy question to me ~Is that a "Treat bag " or "Trick Bag" ? I will choose a winner on 14 Oct.
Have fun colouring and do come join us at CMC Challenge group ~we have very cool challenge for you.